When the cruel Grand B-master of Crestland replaces Crossfire with Road Fight, Kamon and his band of B-shots rise up and bring fun back to the game! 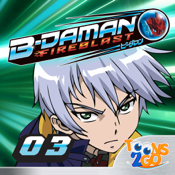 Toons 2 Go brings you the B-Daman Fireblast 1 app! This app features Episodes 19-26 of animation derived from the hit battle toy series and inspired by the Japanese anime manga Cross Fight B-Daman. 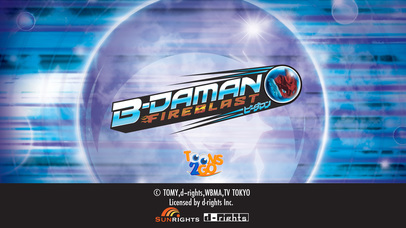 B-Daman Fireblast is the second B-Daman anime series in the Cross Fight saga, succeeding B-Daman Crossfire. It is based on the Emblem Charge System introduced as a series of toys in September 2012. 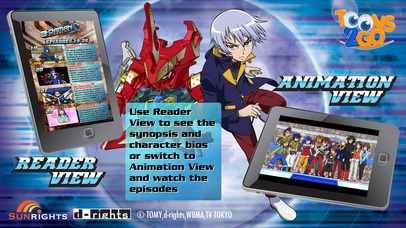 Bonus content includes Fireblast B-Daman character profiles and artwork, as well as Fireblast B-Daman episode summaries. 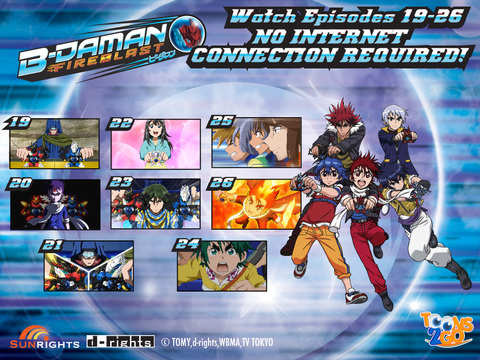 And the best part: Kids can watch episodes 19-26 in the palm of their hands -- no internet connection required! From static print to dynamic animation, Animanga PLUS brings you an engaging interactive versions of your favorite books, comic books or graphic novels and animation for your mobile devices as an Animanga App. In Reader View, read the story as it was intended for print page by page, while in Animation View, see the story come to life panel per panel, or episode by episode. - Reader + Animation Views: Use Reader View to read the bonus content or switch to Animation View and watch the episodes come to life!